The 7100 Series caster is the result of extensive research into a caster that will perform in the 600 to 1000 lb. range. We have found that nut and bolt is preferred over rivet construction. As a result of this all 7100 Series are Standard Nut & Bolt King Pin. The 7100 Series is constructed of 1/4" material with deep dish main bearing raceway & lower race so precise that no shims are required in assembly. Double hardened ball construction allows for easy swiveling and unusual strength. Zinc plated for protection and with grease fitting in swivel head for easy maintenance. Brakes on Swivels & Rigids, add suffix BR after model number. Head seals, add suffix HS after model number. Thread guards, add suffix TG after model number. Delrin bearings, delete RB and add suffix DEL after model number. Brass flange bearings, add suffix BFB and delete RB after model no. 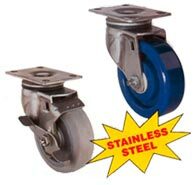 Some models available in 10"
This stainless steel caster is the answer to corrosion problems. Forget about so called casters that are plated in various coatings. Constructed in deep dish double ball raceways, stainless balls, axles, everything on this beauty is stainless. Ideal usage includes cheese factories, slaughter houses, poultry and fish plants and hospital carts where steam cleaning and cleanliness are a must. Head seals standard. Top plate Size: 2-5/18É x 3-3/4. Rigid Plates exactly match swivel plate dimensions. many other models of mountings and type of wheels available.